I recognised that look on George Osborne’s face as he was presenting the Autumn Statement to Parliament. It’s the same one I used to have at school when I’d handed in a rubbish piece of work but had somehow been given a good mark for it. Maybe the teacher had given me someone else’s mark by mistake. Maybe he was just in a good mood. Who cares? By whatever means, I’d got away with handing in a crap essay, and then been praised for said pile of rubbish. The only thing to do was to smile, pretend it had been part of the plan all along and act as though I was worthy of the accolades. The improvements are cyclical rather than structural. We judge the positive growth surprise to have been cyclical, reducing the amount of spare capacity in the economy, rather than indicating stronger underlying growth potential. We do not expect the quarterly growth rates seen during 2013 to be sustained in 2014. The predicted effect on the public finances of this year’s higher growth is very limited. Still, who can blame the Chancellor for enjoying the bounce while it lasts and claiming that his plan worked. He might as well enjoy it while he can. Now if he could just maintain that warm glow until the next election…..
Sure, a bit more growth a bit earlier than expected has helped the OBR’s debt and deficit forecasts look a bit better. The projections say the Primary Balance will be in surplus for 2016-17, a year earlier than the OBR forecast in March, and that the Chancellor can start rolling back the overall debt by the end of the decade. So should we all be smiling along with George? Not really, because the OBR’s deficit forecasts start from the assumption that the government achieves all the public spending cuts it announced in the June spending review. And those cuts are massive! Taking the government’s spending plans and the economic forecasts, the OBR calculates that public spending will fall to around 38 percent of GDP by 2017-18. That’s more or less where it was in the mid-2000s. The trouble is, the pressure on public finances is that much greater now. Interest from the accumulated public debt and a stubbornly high social security bill take up a much higher proportion of public spending than they did in the years before the recession. 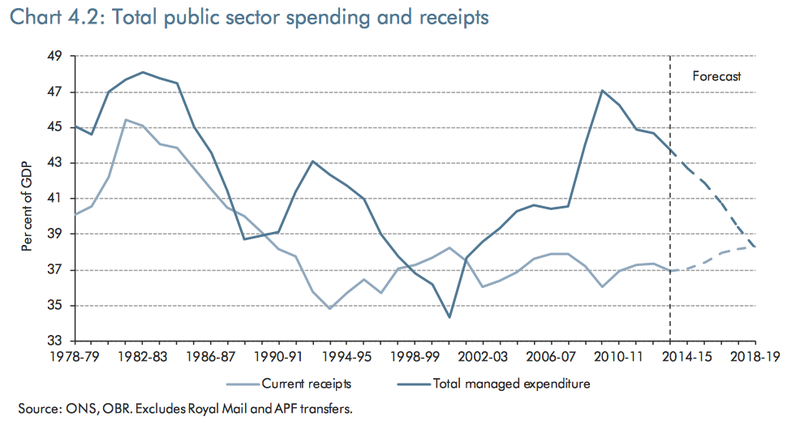 As a result, although the overall spending reduction might look modest, the effect on public service budgets is huge. On this chart, the two darkest blue sections represent spending on public services. It is not until towards the end of the decade that the cumulative effects of welfare savings (the lightest blue) start to show. 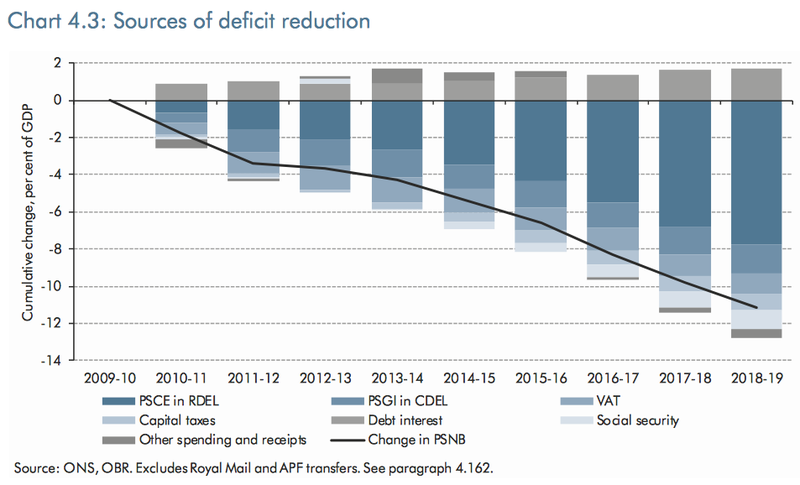 Around three-quarters of the deficit reduction is coming from cuts to public service budgets. [L]et’s not forget the scale of the cuts in spending still to come. 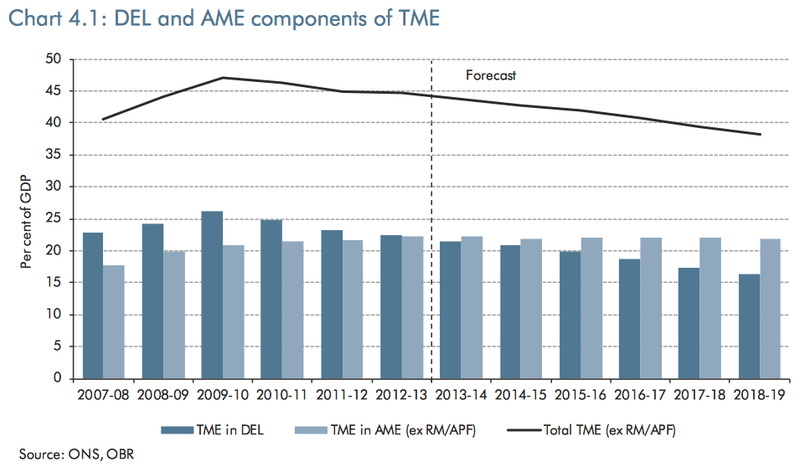 By the end of 2013-14 DELs (that’s Whitehall spending on public services) will have been cut by just over 8%. Absent further welfare cuts, or tax increases, plans to 2018-19 now imply cuts of more than 20% in total public service spending. In other words, by the end of this financial year, we will only be 40 percent of the way through. There will be a lot more cuts to come in the next parliament. This is simple maths. If public spending has to come down and Annually Managed Expenditure (mostly social security and debt repayments) is going up (so keeping pace with growth and staying roughly the same as a proportion of GDP), then public services spending (DEL) must go down. By quite a lot. Down to around 16 percent of GDP by 2018-19. 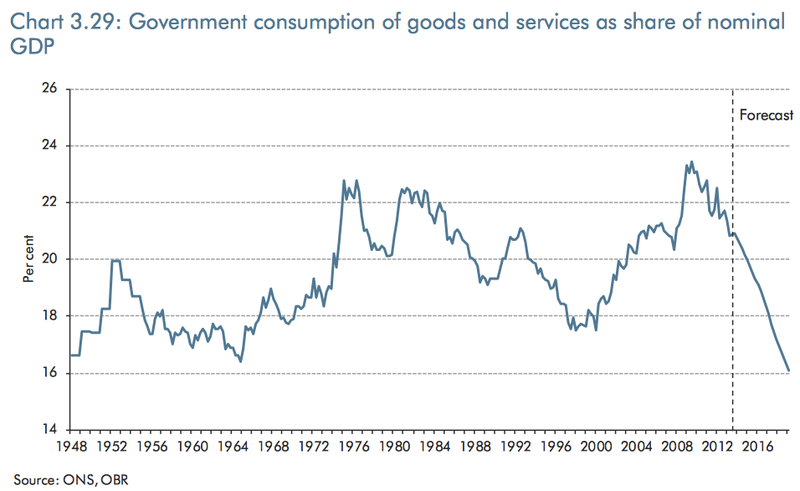 This, as the OBR pointed out, will be the lowest it has been since the founding of the welfare state in 1948. Our forecast implies that the UK’s budget deficit will have fallen by 11.1 per cent of GDP over the nine years from 2009-10 (around £180 billion in today’s terms). Around 80 per cent of the reduction is accounted for by lower public spending. This will take government consumption of goods and services – a rough proxy for day-to-day spending on public services and administration – to its smallest share of national income at least since 1948, when comparable National Accounts data are first available. You don’t have to think about this for too long to see that there may be a problem. Given that the OBR forecasts the combined costs of health, education and long-term care to be somewhere between 12 and 13 percent of GDP by the end of this decade, that only leaves 3-4 percent of GDP for everything else. Now take off defence, which is around 2.5 percent, and you don’t have a lot left. With a budget of 16 percent of GDP for all public services, the state would simply have to stop doing things. Lots of things. That would be very uncomfortable. What are the alternatives? According to the IFS, just to avoid the accelerated cuts and keep the spending reductions at the rate they have been over the past four years would need additional tax increases or welfare cuts of £12 billion a year. Welfare cuts of this size would be extremely difficult, which leaves a good chance of additional tax increases after the next election. Even then, if spending cuts ‘only’ continue at their current rate, the pressure on public services will become severe. For the past few years, public sector organisations have covered their costs by making efficiency improvements, dipping into reserves and cutting things that people won’t notice in the short-term. These strategies are now reaching their limits. The ability of the public sector to continue to cut at the current rate for the next five to six years must be in serious doubt. According to the Joseph Rowntree Foundation, publicly funded art and leisure services may disappear by 2015. Even with slightly better growth forecasts, the proposed spending cuts would see the withdrawal of still more services by the end of the decade. 16% is a silly figure. In saying this I intend no disrespect to the OBR. On the contrary, I assume they intend the figure to be seen as silly- as a covert critique of fiscal plans which, while coherent in a purely accounting sense, are essentially fantasy. The Chancellor doesn’t have ‘plans’ to reduce spending on public services to pre-welfare state levels. He doesn’t have a plan at all, just a set of forecasts intended to maximise political advantage in the run-up to the next election. After which, assuming he is still chancellor, he will either raise taxes or reschedule fiscal consolidation again, as would any chancellor who inherits this mess. So the real message from this forecast, I suggest, is not about Conservative plans to roll back the state. It is that the government is going through the motions of offering completely irreconcilable outcomes in the hope that nobody will notice the implications until they’ve secured a second term. He may well be right. Looking at the data and forecasts from both the OBR and the IFS, it’s difficult to see how George Osborne’s deficit plans are achievable without the near-collapse of public services or a hike in taxes. People will either see services they rely on disappear or they will have to pay more tax. So far, very few politicians are being open about this. It’s the welfare scroungers, the lazy public servants or the filthy rich who will have to pay for reducing the deficit. Mr and Mrs Hardworking will barely feel a thing. But even with the modest improvement in economic growth, this is a myth that can only be sustained for so long. As we will all find out, shortly after the next general election.